How was your weekend? Paul Ryan's weekend was good. How good was it? Well, part of his recreational time this weekend was spent kissing a fish on the mouth, according to his Twitter. The fish, as anyone would be, is frowning deeply. The fish is clearly upset. 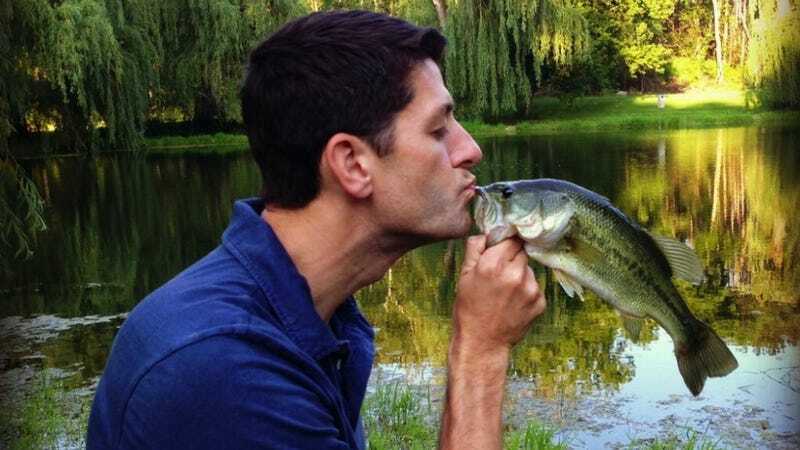 I don't know what Paul Ryan does with his sea creatures after he catches and osculates them (maybe he Shake Weights them to death and then eats them? ), but if we assume that he let it go, we have to wonder: what is the rest of the creature's life going to be like? "The fish seems different," his aquatic friends will say, noticing his withdrawn and angry behavior. "He's lost all interest in gulping at the flies that foolishly land on the surface of the pond. All he does is stare forlornly at that bit of seaweed while slowly shaking his head. It's almost as though a conservative buffoon pressed his lips to his face." On the ground, however, everyone is probably having a wonderful time making end-of-DOMA jokes. SACRED UNION BETWEEN MAN AND FISH, etc etc.